Artists managed by YG Entertainment, one of the largest K-pop agencies in South Korea, are pouring out new albums back to back in the first half of this year. 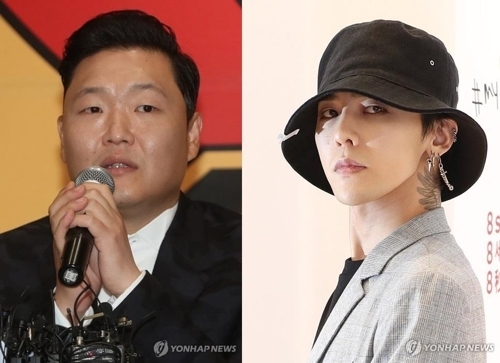 Starting with Akdong Musician in January, five other YG artists have presented new albums in a row -- Winner and Sechskies in April, Psy and iKON in May and G-Dragon in June. Girl group Black Pink will be the next to drop an album on June 22, according to the agency. Recently, there has been some bad news. Big Bang member T.O.P was indicted on charges of smoking marijuana and was hospitalized from an apparent overdose of benzodiazepine. But the entertainment agency and its artists seem to remain largely unaffected by the scandal. As of Tuesday, "Untitled," the title track off the Big Bang leader G-Dragon's fourth solo album, stayed on top of the Melon's music chart for the sixth day. Including "Untitled," a total of five songs from YG artists made the top 10 spots of the chart. On the same day, YG uploaded a teaser image of a Greek temple shaded with pink lighting on its official blog to inform fans of Black Pink's upcoming return.